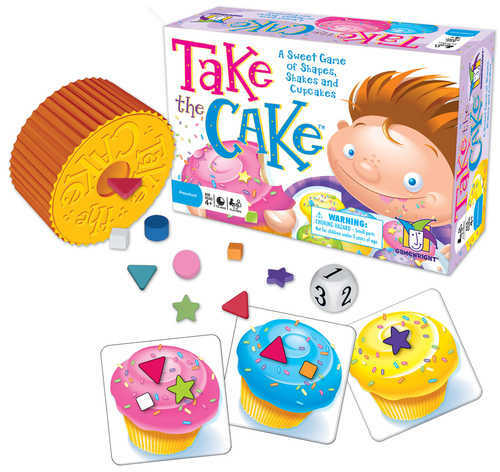 Take the Cake is a simple game that’s pure fun! Shake the sprinkle shaker and see which colourful shapes spill out. If any match a cupcake, place them on the card. If you match all the shapes, the card is yours to keep! The player with the most completed cupcakes at the end of the game is the winner. As you shake the shaker, you develop fine motor skills. This game is also great for shape and colour matching and recognition. Cup Cakes are YUM! That’s enough reason to love it. Make a batch of real cupcakes with your children and, while you wait for them to bake, play the game together. When they are ready you can use the dice to help decide how many sprinkles you will use to decorate each one. Yummy yummy! Gamewright create high quality educational, award winning games. Their games are designed for young children and families, are quick to play and lots of fun. Take the Cake is available from Fishpond (www.fishpond.com.au) or eBay (www.ebay.com.au).